Jeffrey Goldberg’s detailed exposition in The Atlantic of Barack Obama’s foreign policy outlook has sparked a wave of media commentary as well as damage-limitation efforts by the White House. 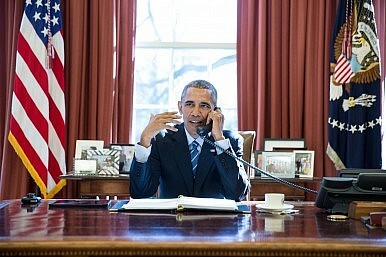 Based on a series of far-reaching interviews with the U.S. president, the piece contains a number of fascinating revelations, including Obama’s high regard for his own decision-making ability and corresponding disdain for the leadership skills possessed by many of his counterparts on the world stage; his suspicion of Washington’s foreign policy cognoscenti, whom he believes adulate the idea of deterrence credibility and in any case reflect the interests of their Jewish and Arab benefactors; and his disregard for America’s traditional allies in Europe and the Middle East. On this last point, Goldberg quotes Obama as saying “free riders aggravate me” – a sentiment that Donald Trump holds as well. At the time his threats against Iran were uttered, mainly in the run-up to the 2012 presidential election, a number of observers, including Israeli Prime Minister Benjamin Netanyahu and then-Defense Minister Ehud Barak, thought the president was blowing smoke. The Goldberg piece, especially its focus on Obama’s abrupt retreat in August 2013 from enforcing his red line on chemical weapons use in Syria, provides ample justification for this belief. Although Obama had once spoken publicly about how America’s credibility mandated a forceful response to the Bashar Assad regime’s use of chemical weapons, he now derides the very notion of deterrence credibility for having steered Washington into the morass of the Vietnam war. He takes pride, he relates to Goldberg, in breaking decisively with foreign policy nostrums that prescribe “militarized solutions” to a variety of world problems. Any president who was thoughtful, I believe, would recognize that after over a decade of war, with obligations that are still to this day requiring great amounts of resources and attention in Afghanistan, with the experience of Iraq, with the strains that it’s placed on our military—any thoughtful president would hesitate about making a renewed commitment in the exact same region of the world with some of the exact same dynamics and the same probability of an unsatisfactory outcome [emphasis added]. Obama claims in his talks with Goldberg that the threat of military action against Iran was not idle, since Tehran’s possession of nuclear weapons would have directly affected U.S. national interests. Yet the views he articulates throughout the piece, including in the passage just cited, provide substantial evidence to the contrary. Indeed, the president dilutes his own claim by admitting “the argument that can’t be resolved, because it’s entirely situational, was what constituted [Iran] getting” nuclear weapons. Dennis Ross, who served as the White House’s point person on Iran for most of Obama’s first term, provides further evidence on this issue in his recently published book, excerpts of which appeared in Politico. He reports that Obama early on directed the Pentagon to draw up plans for military action against Iran’s nuclear infrastructure and measures were taken to strengthen the U.S. military presence in the Persian Gulf. Yet he also acknowledges that the additional deployments of missile defenses and naval forces were motivated in part by a desire to be ready for Iranian retaliation in the event Israel undertook its own military action against Tehran, a contingency that much worried the Obama White House. Where Obama came down in this internal debate is unclear. Ross contends he urged the president in early 2010 to jettison the vague statement that Iranian nuclear proliferation was “unacceptable” in favor of a stiffer formulation along the lines that the U.S. was “determined to prevent” this outcome. Obama finally accepted the more definitive language but only after thinking about it overnight. It is striking though that even this formulation is not as robust as the unequivocal red line the president drew two years later regarding Syrian chemical weapons use and then ultimately abandoned. Based on the sum of Obama’s thinking on the Middle East, as related by Goldberg, it is difficult to pay credence to his profession about the sincerity of his earlier threats against Tehran. Indeed, it seems much more likely they were aimed more at restraining the Israeli government than pressuring the Iranian one. David J. Karl is president of the Asia Strategy Initiative and former director of studies at the Pacific Council on International Policy. He can be reached via Twitter @DavidJKarl.